Heeft u een vraag voor Ming Lu Holiday Hotel? Of u nu een toerist bent of een zakelijke reiziger, Ming Lu Holiday Hotel is een uitstekende accommodatie tijdens een bezoek aan Nantou. Gelegen op 49.7 km van het hart van de stad, bevindt dit 3-sterren hotel zich op een excellente locatie met de grootste attracties binnen handbereik. Voor mensen die er op uit willen zijn Lushan Bridge, Cingjing Veterans Farm, YunLong Qiao slechts enkele van de attracties die beschikbaar zijn voor bezoekers. Het Ming Lu Holiday Hotel biedt gasten superieure dienstverlening plus een breed scala aan voorzieningen en is toegewijd om uw verblijf zo comfortabel als mogelijk te maken. Gratis wi-fi in alle kamers, 24-uur beveiliging, keuken, taxi service, rolstoelvriendelijk zijn slechts enkele van de faciliteiten waarmee het Ming Lu Holiday Hotel zich onderscheidt van andere hotels in stad. Gasten kunnen kiezen uit 160 kamers, stuk voor stuk plezierig en comfortabel ingericht. Hotelfaciliteiten als hot tub, thermaalbad , zwembad (buiten), wellnessfaciliteiten, tuin bieden alle gelegenheid om te ontspannen na een drukke dag. 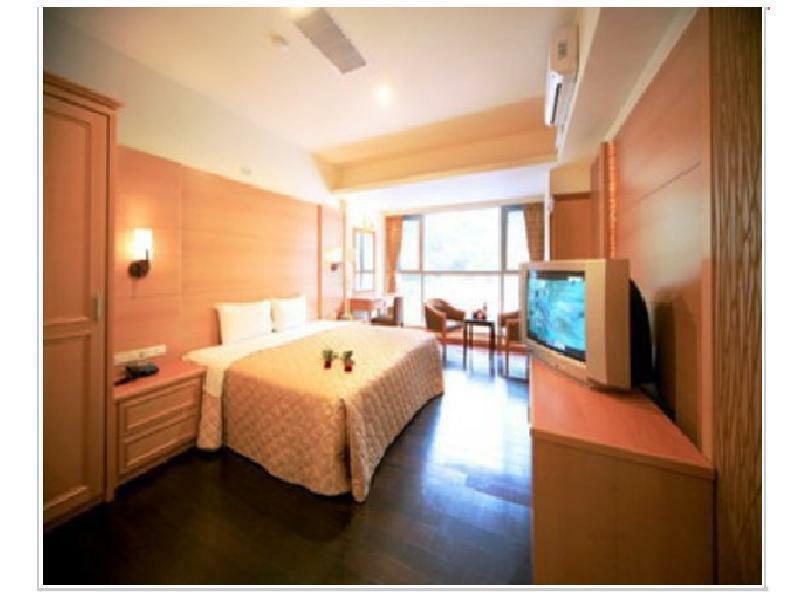 Het Ming Lu Holiday Hotel is een ideale verblijfsplaats voor reizigers die charme, comfort en gemak zoeken in Nantou. May not be the modest exterior or interior, but hot spring facilities made up all. Spring water available in the room tub! Will be backed. Nice night view, nice spa, fresh air, honestly great food, Great chef. Don't get cheated like me. Photos shows was very nice, but everything was very poor, worse and bad. Regret!!! Defiantly will not visit again. 3 to 4 star hotel?? I'll rate 1 star where bad room condition, old furnishing, leaking, bad service staff, I never met a hotel that i need to collect hair dryer, tower, US plug by my myself. We came to this Hotel by our car, but since we didn't check how is the route to get there. We are a lil bit disappointed because its too far. The hotel "looks good" but not really comfortable. I found a cockroach in the bathroom, even it looks like nobody used it for a long time. Totally, If you have no choice, this hotel is fine just not really good for long time stay. I stayed for just one night, and feel thankful to not stay more than one night. the hotel looks great from the outside. But it's aged at the lobby and room. Some facilities are not in operation or well maintained. This place, Lu shan, is extremely quiet and slow pace. Not much amenities around. The breakfast is very local and basic. The only plus point is the onsen facility in the room. The hotel is old. Bathroom sink area is not clean. The ventilation is bad in the dining hall so it smells of food the whole day. You have to clear your own plates after breakfast. Go somewhere else if you want a decent hotspring hotel. Ming Lu Holiday Hotel seems to be one of the biggest hotel in the area and is quite near the famous Lu Shan bridge (around 2 minutes walk). However, it's sad that the place is not well maintained and a bit run down. The sofa in the hotel lobby was torn and one can see the stuffing inside! The room I got was very dusty and I can even see the dust on the white colour bedsheets and blanket covers etc. BTW, I got a family room with 2 double beds. I have mixed feelings regarding the hotspring pools. There are 2 floors with hotspring pools. The first floor is just 3 regular pools with hotspring water. 1 of the pool with warm hotspring water and 1 of it with cold hotspring water. The third pool was empty but from the sign above, it was supposed to be hot hotspring water. On the second floor, there's a big pool with warm hotspring water and there are different massage features at different corners of the pool. I find the opening hours of the hotspring pools too short. It was supposed to be opened until 10pm but the staff came to chase guests away at 9.45pm! We could have soak in the hotspring water in our own hotel room but the feeling is different. All in all, I wouldn't choose to go back to the hotel again. The experience is totally not worth the amount of money paid. disappointed. breakfast was terrible, facility is all way too old. over priced for the room we booked!! Furnitures in room are outdated and malfunction. Very dissapointed. The whole area has been banned by the government and several hotels have been closed. There are few tourists. Room is clean and spacious. Like the hot spring over there. Worth the money! Thumb up!! !